I didn’t realize I hated my Xbox One until I loaded Fallout 3 on it and felt all warm and fuzzy when I saw the Xbox 360 logo and heard the Xbox 360 theme. It was Thursday, and it was the first time my Xbox One has ever made me feel warm and fuzzy. All it took was for Microsoft to start putting an Xbox 360 inside it. I try not to be a platform loyalist. There are good games you can play only on the Wii U, or only on a PC, or only on your iPhone. But if you made me take a side in the 15-year rivalry between Microsoft and Sony, I would say that I was an Xbox player from 2001 until 2013, when the PlayStation 4 came out. Like most everyone I know, I’ve gravitated toward the PlayStation 4 over the past couple of years after preferring the Xbox 360 to the PlayStation 3. The PS4 is where most of my friends and colleagues play. Its menus seem to run faster. It is much easier to share screenshots and game videos from it. What takes a few button presses on a PS4 involves some shouting on a Kinect-enabled Xbox One, followed by a teeth-gritting tour through a kludgy interface to get your images or videos onto the Internet. Even so, I’m not surprised that I have finally started to hit it off with my Xbox One after an awkward first date. There’s a new Halo game. Microsoft has a timed exclusive on the new Tomb Raider. The new dashboard is a much-needed improvement. What I didn’t expect was for backward compatibility—limited backward compatibility!—to be the thing that made me think, for the first time ever, that the Xbox One has something important that the PS4 doesn’t. Home consoles should evolve into ecosystems like the iPhone’s or the Kindle’s (or the 3DS’s, or the PC’s), where you can buy a new device without having to worry about losing all the stuff you bought on the old version. When I turn on my Xbox One, the backward-compatible Xbox 360 games that I own in digital form now appear in my games folder. I can hop into Fallout 3, Just Cause 2, and Super Meat Boy without changing machines. 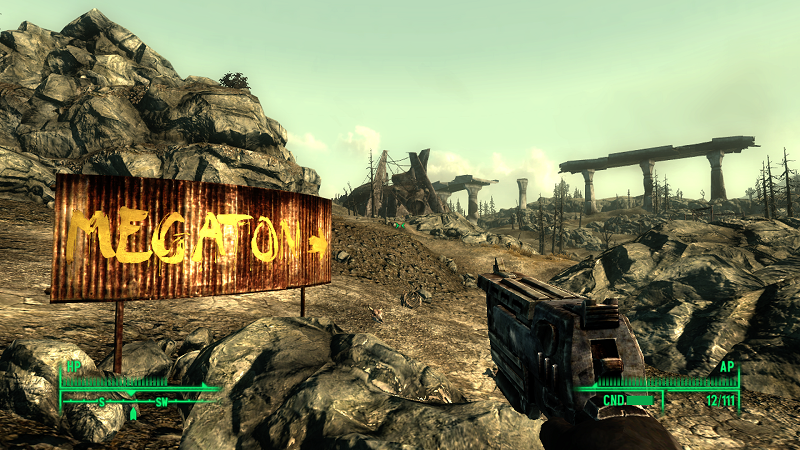 I can take screenshots—like the one above of the road to Megaton from Fallout 3—or record videos, and then share them or upload them to my OneDrive account. You can’t, alas, use the suspend-and-resume feature that allows you to all but ignore save points on next-gen machines. That feeling I had on Thursday, of seeing an old friend, was created in part because until then it seemed like my Xbox 360 was gone forever, sentenced to sit unloved and untouched next to its big brother. We develop feelings for our game consoles and our computers unlike those that we have for any other machine, save for maybe our cars. It’s no coincidence that some people name their computers and their cars, but never their coffee makers or their televisions. We touch them, and not just once and quickly. We spend time alone with them. We travel with them to new places. We tell them our secrets. They know us as we really are. This is starting to sound a little gross, and that’s why we make fun of people who love their cars and their computers too much. These are the machines we can know intimately—too intimately. Maybe that’s why I couldn’t stay mad at my Xbox One for too long, even as most of the games that I own as digital downloads on my Xbox 360 are still locked up. I’d love to be able—really, I ought to be able—to play Bastion, Braid, Limbo, Fez, Brothers, and The Wolf Among Us on my Xbox One. Heck, why not Texas Hold ’em and Uno? For the first time, my Xbox One now makes me a little angry at my PlayStation 4, rather than the other way around. Sure, Sony ported Journey to the PS4, but why I can’t I play my downloaded PS3 version of Okami, or Telltale’s The Walking Dead, on my PS4—or any of my many, many PlayStation Plus games? It’s a small thing, but being able to take screenshots and videos easily of Fallout 3, and then jump right back into Fallout 4, feels terrific. It feels like the kind of thing a new computer or a new phone can do for you: improve the way that you interact with the stuff you already own, in addition to bringing you new ways to interact with new stuff. New game consoles almost never create that feeling. That’s why it usually takes a couple years of new game releases for many players to regard them as justifiable purchases. The buzz I felt yesterday, when I heard the Xbox 360 theme, is irrational nostalgia. But it’s entirely rational to want to own a game system that you don’t have to restock every five or 10 years. The Xbox One—and heck, the PlayStation 4—should have felt like this from the start, like an upgrade for your beloved game console, rather than a replacement for it. Maybe I’ve been thinking of my Xbox One as an unwelcome stepconsole, because I couldn’t forget the one that came before. This week was the first time I thought it might become a member of the family.